Koons, Jeff and Norman Rosenthal. Jeff Koons: Conversations with Norman Rosenthal. Hove, England: Thames & Hudson, 2014, p. 98 (installation view, International at Monument, 1985). Modern Art Museum of Fort Worth. Urban Theater: New York Art in the 1980s. Exh. cat., China: Skira Rizzoli Publications, 2014, p. 92. Moderna Museet. Sculpture After Sculpture: Fritsch/Koons/Ray. Exh. cat., Ostfildern: Hatje Cantz, 2014 [Texts by Jack Bankowsky, Thomas E. Crow, Nicholas Cullinan, Made Great, conversation between Michael Fried, Isabelle Graw, Michelle Kuo, Charles Ray, Scott Rothkopf] p. 67. Romanacce, Aurélie. “Jeff Koons: Le Roi Midas.” Arts Magazine December 2014, p. 109. Blissett, Luther. “Sept moments-clefs dans une vie d’artiste.” Beaux Arts Magazine December 2014, p. 8-9 (installation view, International with Monument). Acquavella Galleries. THE POP OBJECT: THE STILL LIFE TRADITION IN POP ART. New York: Rizzoli International Publications, Inc., 2013, p. 205. Bouvier, Raphaël. Jeff Koons: Der Künstler als Täufer. Germany: Wilhelm Fink Verlag, München, 2012, p. 247, pl. 7. The Brant Foundation. Remembering Henry’s Show. Greenwich: The Brant Foundation., 2010, p. 79, 90, and 174, illustrated in color. "Skin Fruit: Selections from the Dakis Joannou Collection." Paper (Vol. 8) Spring/Summer 2010, p. 4, illustrated in color. Holzwarth, Hans Werner, ed. Jeff Koons. Cologne 2008, p. 143, illustrated in color. Crow, Thomas. “Marx to Sharks.” ARTFORUM April 2003, p. 48. Shortcuts from the Dakis Joannou Collection. Exh. cat., Greece: DESTE Foundation for Contemporary Art, 2002, pp. 10, 14 (installation view, House of Cyprus, Athens, 1988), 21, 39 (installation view, Athens School of Fine Arts, Athens, 1996), 42 (detail), 44, 56-7, 60, 76. Kunsthaus Bielefeld. Jeff Koons: Pictures 1980 - 2002. Exh. cat., 2002, p. 19, illustrated in color (installation view). Deutsche Guggenheim. Jeff Koons: Easyfun-Ethereal. Exh. cat., Berlin, 2000, fig. 12, p. 30, illustrated in color. Muthesius, Angelika, ed. Jeff Koons. Cologne 1992, fig. 3, p. 55, 57 (installation view, International with Monument), illustrated in color. 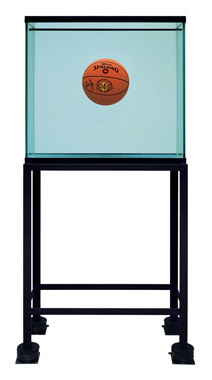 Koons, Jeff. The Jeff Koons Handbook. Anthony d'Offay Gallery, London 1992, p. 55, 154. Aarhus catalogue (no. 14), p. 29, illustrated in color. Amsterdam & Stuttgart catalogue. p. 19, illustrated in color. Amsterdam, Stedelijk Museum; Denmark, Aarhus Kunstmuseum and Staatsgalerie Stuttgart. Jeff Koons Retrospektiv. Exh. cat., 1992. Museen Haus Lange und Haus Esters. Weitersehem (1880-1990). Exh. 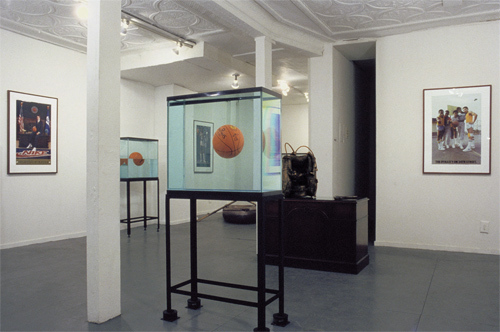 cat., 1990, p. 42, (installation view). Museum Ludwig. Europa/Amerika: Die Geschichte einer kunstlerischen Faszination seit 1940. Exh. cat., Cologne, 1986, p. 316, illustrated (installation view).